Drape measures 48" x 52". 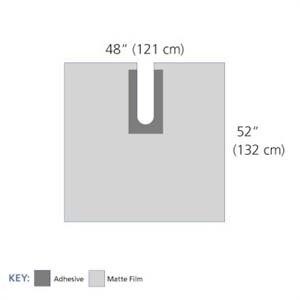 Adhesive area measures 10" x 19" and "U" fenestration measures 6" x 19". “U” fenestration with wide adhesive area. Advanced adhesive provides excellent adhesion with no residue. Strong, drapeable, low-glare matte-finish film. Split, waxy paper liner for ease of application. Sterile. Sold 10 per box.